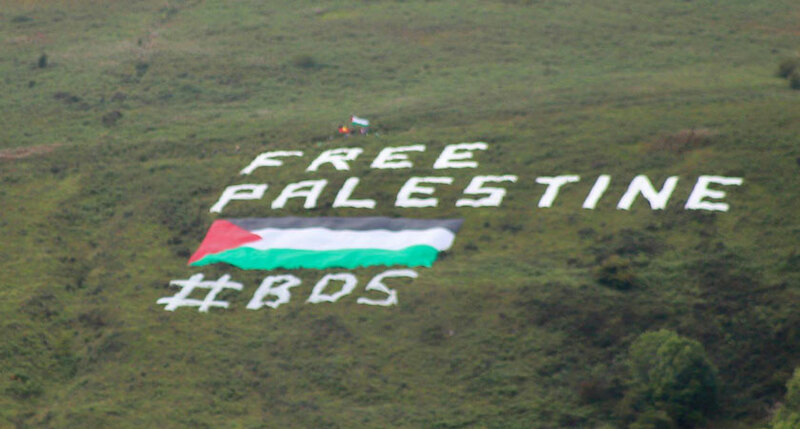 A HUGE ‘Free Palestine’ sign has appeared on Belfast’s Black Mountain in protest at Israel’s soccer match with Northern Ireland. The 60m x 20m display is accompanied by a large Palestinian flag and the hashtag ‘BDS’ (boycott, divestment, sanctions). Meanwhile a protest took place at the Broadway Roundabout ahead of the game close to the Windsor Park venue. Reports claim there were up to 200 pro-Palestinian protestors, while a counter-protest took place nearby. Last week Sinn Féin led calls to have the game cancelled, while unionist politicians accused critics of the fixture of 'hijacking' it for political gain. Those behind the display claim it is a protest at the Irish Football Association’s decision to play the game in light of what it calls Israel’s human rights violations. In a statement on Facebook, Gael Force Art said: “Israel maintains a system of settler colonialism, apartheid and occupation over the Palestinian people, a history that is all too familiar to our own here in Ireland in which the northern state was built on. Meanwhile as protestors gathered close to Windsor Park ahead of the game, Gerard Foster from the Irish Republican Socialist Party said it was important to protest sporting events. “The occupation forces in the West Bank and Gaza are shooting Palestinian football players in feet so they cannot play football again,” he said, “so anyone trying to say we shouldn’t be protesting a sporting event, think about that. The Irish Post has contacted the Israeli Embassy in London, which has jurisdiction for Northern Ireland, for comment. The display on Black Mountain drew both praise and condemnation online, with former Sinn Féin leader Gerry Adams tweeting his support. Northern Ireland won tonight's game 3-0, with goals from Steven Davis, Stuart Dallas and debutant Gavin Whyte.